Bovis Homes employees have raised enough money to make a life-changing difference to five families living in poverty across the world. In handing over £6,650 to Habitat for Humanity, the national housebuilder is donating enough for five new homes to be built in areas of the world hit by poor living standards and homelessness. It is the latest round of fund-raising for their corporate charity, with the cash being raised by all staff who completed an in-house employee survey. 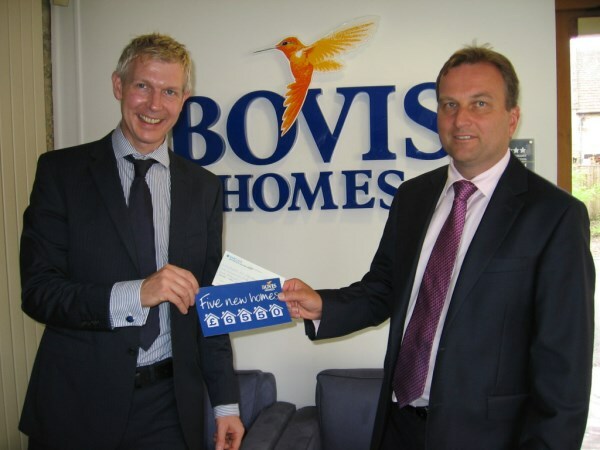 For every survey sent in, Bovis Homes agreed to donate a sum of money, reaching a final grand total that was hailed by the charity as, 'a fantastic sum'. "These funds will make a huge difference to our ability to support more people living in real poverty by enabling us to build and provide five new homes for families that would otherwise have been living in cramped, unsafe and unhygienic conditions," said Phil Wormley, Fundraising Director for Habitat for Humanity. "These homes will provide a transformational difference to their lives and their futures, giving them the hope and opportunity they need and deserve. We are very grateful for the fantastic sum of £6,550 that Bovis Homes have been able to raise through the staff survey, which was a great initiative, and we are delighted to be able to put this funding to such great use." Kevin Wilkins, Group Marketing Director for Bovis Homes said: "Our relationship with Habitat for Humanity is a very important one for us and represents a cause close to our hearts. "It is something our staff really buy into - and we knew that by taking this initiative with the employee survey we would get a healthy return!"